Rose garden are nostalgic, sweet, and romantic, which is probably why they are so very popular. Whether it’s a garden full of exotic hybrid color roses or a garden full of just red roses or just white roses, the results are always stunning. Their blossoms radiate and create beauty.For centuries people have given roses in bouquets of love and bathed in rose water. They perfumed their bodies and homes with rose oil, scattered rose petals around rooms, awarded roses for achievement, planted roses in their gardens. This queen of flowers graces the mind, the home, and the landscape. Roses have almost as many forms as they have uses, and are classified accordingly. Roses are classified into a variety of classes and subclasses according to origin, bloom type, and habit. These groups include species, shrub, climbing, old garden, and miniature roses, as well as the familiar hybrid teas, grandifloras, and floribundas. Each group has characteristics that suit it for specific landscape uses. Hybrid tea, floribunda, and grandiflora roses produce spectacular blooms. These roses are best planted in masses, perfect on rose garden where they create grand splashes of color in the landscape. The grandifloras are taller than floribundas and produce fairly long-stemmed roses, making them ideal plants for background border. Shrub roses combine both a pleasing form and beautiful flowers. They have a more informal growth habit than hybrid teas, floribundas, or grandifloras, and so can be, and often are, planted individually in the landscape. They are very durable plants. Old garden roses have begun regaining much-deserved popularity among gardeners. Both shrub and old garden roses are further divided into many different classes based on flower form and origin, and both groups include many valuable landscape plants. Miniature roses are ideal for edgings and container plantings. Climbing roses have long arching canes that reach 6 feet or more in length. This group is divided into several types, including large-flowered climbers, which bear medium or large blooms in small clusters and climbing hybrid teas. Both have thick, somewhat stiff canes, and an upright habit. Rambling roses have flexible, thinner canes and cluster of smaller blooms. Climbing roses have no tendrils with which to hold onto trellises or arbors, so you will have to fasten the canes loosely to these structures. What Do We Need to Know About Growing Roses? Roses thrive in a place with good sun and good air movement, which helps the dew and the rain to dry quickly, discouraging disease problems. Too much wind, however, can damage the foliage in summer and the canes in winter. If you live in a windy area, plant roses where they will get some protection, such as near a wall, fence, windbreak, or hedge. 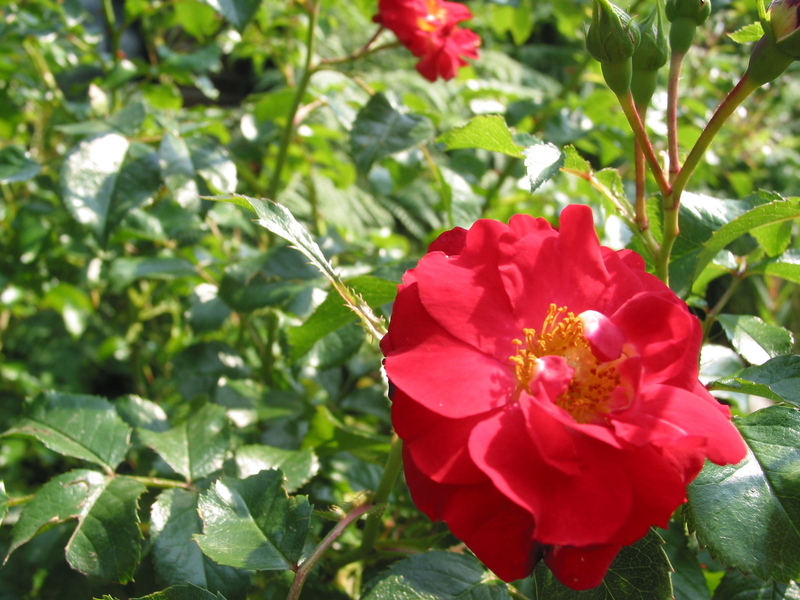 Unlike most shrubs, roses are a bit more precise in their planting requirements. In the end, of course, if you place them in rose garden with good soil and provide them with a proper environment, your planting techniques become secondary. Nevertheless, you will enjoy healthier more vigorous roses if you plant them correctly. Roses can be touchy to grow, though, so if you’re planning to create your own rose garden be sure that you do some research and that your area of the country can sustain delicate roses. These are not low-maintenance plants. They require a fair amount of care in order to look their best, but they’re worth it.